Giving open access to the people of the state through his mobile phone immediately after assuming office seems to be costing dear to Punjab Health and Family Welfare Minister and senior BJP leader Sat Pal Gosain, who is now having second thoughts about this practice which is causing him pain, literally that is. The suspense over the whereabouts of a youth from Lamma Jattpura village near Jagraon, who was kidnapped from Jagraon Bus Stand two days ago, came to an end this afternoon when the body of the youth was found from a canal near Badhani village in Moga district. 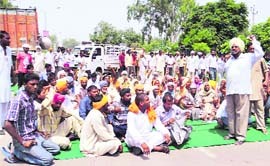 Family members of a Dalit youth, Gagandeep Singh from Lamma Jattpura village near Jagraon, a suspected victim of honour killing, held a protest on the Ludhiana-Ferozepur highway near Jagraon bus stand this morning. Call her a freak or too obsessed with mobile phone, the girl was doing almost everything to make the life of Deepak a virtual hell. 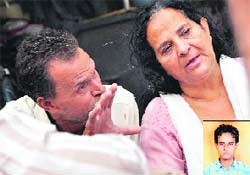 The girl, who is facing charges of poisoning her lover Deepak, is on the run along with her family members. The confiscation of pirated CDs means free entertainment for cops and their families, as many times, during the counting of these CDs, copies of latest flicks are taken out for ‘safe keeping’. Such CDs are then distributed by cops to their friends and family for viewing in a homely atmosphere. Getting a first information report (FIR) registered seems to be an arduous task even for MC officials who, for the past week, have in vain been making rounds of the Division Number 8 police station. An elderly woman of Malak village, near here, who had gone missing under mysterious circumstances a few days ago, has been found to have been killed by her own son. 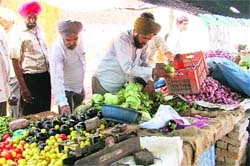 As a preventive measure against an outbreak of seasonal diseases like cholera, gastroenteritis, dengue and malaria, the health officials today carried out a comprehensive drive against sale of rotten, overripe or under ripe fruits and vegetables in several city localities while also educating the public with other necessary steps to keep these diseases and infections at bay. Perturbed at the delay in the completion of a sewerage project going on in the Jassian Road area, the residents held a protest outside the office of the sewerage board here today. 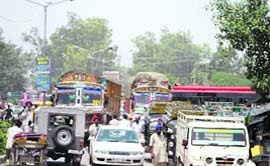 Residents of Jandiali have threatened the police of doing an Anna act i.e. sitting on hunger strike, if the police did not arrest a woman wanted in a murder case. The half-day bandh call given by the ruling SAD-BJP combine in protest against the jacking up of prices of diesel, cooking gas and kerosene by the Congress-led UPA government at the Centre turned out to be a damp squib, with the industry, trade and shopkeepers by and large ignoring the bandh call. Trade and Industry in the city did not responded to the bandh call given by the ruling SAD-BJP combine in protest against the recent hike in the prices of diesel, kerosene and LPG. Although the industry is directly affected by the rising prices but it decided to keep itself aloof from the bandh. The proposal to levy cross-subsidy surcharge on the open access of power has irked the industry as they fear it may prove to be a nail in their coffin. The industry feels the Punjab government is out to extract as much revenue as it can from the energy sector to meet the expenses of its freebies of sorts. 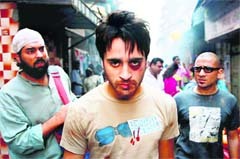 Foul language, offensive characters, adult content it is all there in Aamir Khan's production "Delhi Belly". The film has a lot of offensive language, which has not gone down well with the family audiences but the younger audience has given it a green signal. Well, all the remarks about the explicit content of "Delhi Belly" only created the temptation of the forbidden fruit among the movie buffs. Punjab National Bank (PNB) employees had a providential escape after the roof of an emergency staircase collapsed in the bank’s circle office located on the Ferozepur Road here today. The incident took place around 11 am when the roof of the emergency staircase collapsed all of a sudden and fell on the vehicles parked underneath. The bank employees were shaken by the sudden thud and ran for cover. Some employees took it for an earthquake and ran out of the premises. A 179-year-old house collapsed at Passian Mohalla, near Daresi ground, here today. 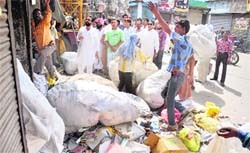 The absence of fumigation machines with the Ludhiana Improvement Trust (LIT) seems to be taking its toll on the residents of five localities developed by the trust. These localities have not been handed over to the municipal corporation yet. Cleanliness in offices seems to be high on the agenda of Deputy Commissioner Rahul Tewari, who has embarked on a novel way of keeping his official complex clean by organising competitions. A meeting of the Punjab Poultry Farmers Association was held today to discuss the difficulties being faced by them. BCom remains the most sought-after stream among students in the city this year. If the government and private college authorities are to be believed, more than 4,000 students from the city have opted to get admission in BCom (I). As per the merit list of candidates, available online, those candidates who have scored 92 per cent marks in Class XII (without mathematics), will not be able to get admission in their preferred colleges this time. Guru Angad Dev Veterinary and Animal Sciences University (GADVASU), Ludhiana, has taken a step against ragging by instructing all its students of College of Veterinary Science, College of Dairy Science & Technology and College of Fisheries to furnish an undertaking against ragging. First year students of Bachelor of Veterinary Sciences (BVSc) of Guru Angad Dev Veterinary and Animal Sciences University (GADVASU) have shown poor results, as 24 students out of total 70 students have failed in the examination, while about 18 students got compartment. The souvenirs introduced by Punjab Agricultural University (PAU) last year, remained preferred among the NRIs or alumni of the university, while university students have shown no interest for the souvenirs on which PAU is written. Angry at not getting appointment letters, nearly 50-60 teachers, who were working as English language service providers swarmed the District Education Officer's office here today.